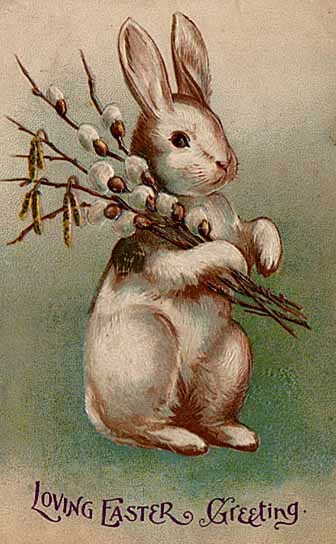 The Easter Bunny (also called Easter Hare or Spring Bunny) is a character who brings baskets filled with colored eggs, candy and sometimes also toys to the homes of children on the night before Easter. It is depicted as a rabbit sometimes with clothes. When Easter Bunny brings the gifts, it will either put the baskets in a designated place or hide them somewhere in the house or garden for the children to find when they wake up in the morning. Like Santa Claus, Easter Bunny brings gifts to children on the night before the holiday. Easter Bunny and the eggs symbolize fertility. Since birds lay eggs and rabbits and hares give birth to large litters in the early spring, these became symbols of the rising fertility of the earth and were adopted by early Christians as a symbol of the resurrection of Jesus. Easter Bunny brings gifts in a bag. The custom of Easter Bunny is very much like that of Santa Claus. Easter Bunny brings gifts on Easter Day. Easter Bunny and The eggs are fertility symbols.